The hotel Wyndham Garden Duesseldorf Mettmann is situated in the county town of Mettmann, a lively town close to the world famous Neandertal valley. Mettmann is situated between the regional capital Düsseldorf, the Rhineland, the Ruhr area and the "Bergisches Land". Our hotel near Duesseldorf is perfectly served by the transport network: You can reach Düsseldorf Airport and the Messe Düsseldorf trade fair centre from the hotel in just a few minutes. Wyndham Garden Duesseldorf Mettmann Hotel is also conveniently close to the surrounding cities of Essen, Düsseldorf and Cologne. Access to the A3, A44, A46, A52 and A57 motorways and the Mettmann-Düsseldorf regional train service ensures easy access to the hotel. Walk in the footsteps of our ancestors: In the late 19th century human skeletons were found in the original valley of the small river Düssel with impressive natural backdrop. Later the historical discovery was identified as the remains of our ancestors. From then on, the term "Neanderthal" was known throughout the world and the area Neandertal became a popular destination. 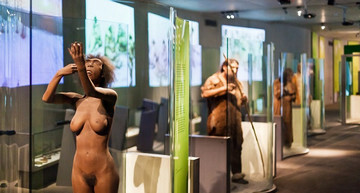 The Neanderthal Museum Mettmann gives each visitor an understanding of the development of our humanity. Experience a journey through an impressive history of four million years and the architectural feat of the building. The museum is opened from 10 a.m. till 6 p.m., except on Mondays. On the historic market square you can find the flagship of the city, the “Alte Bürgermeisterei”. 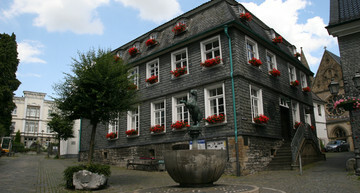 The historic building, which was built in the late 16th century, is now a popular place for events and contains the city history house. There the life and work of urban residents Mettmann is told from the early history to the present. 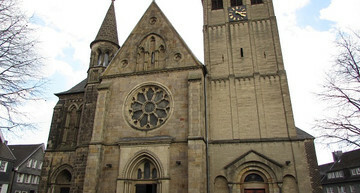 Built in the 12th century the Romanesque church is one of the landmarks of the city Mettmann and seat of the Catholic community. The church is opened from Tuesday to Sunday, 9 a.m. to 6 p.m. Marvel the magnificent nave, the historic baptismal font and valuable objects of art. The Ice Age Wild Park is located in the nature reserve Neandertal. Not only rare animal species, but also the incomparable nature with lush green meadows and hiking trails are worth to visit. In the 18th century Benrath Palace was built by order of Elector Carl Theodor von Pfalz-Sulzbach as a pleasure and hunting palace. Nowadays, the artistically designed park with the romantic castle Benrath is considered as one of the most popular and most beautiful destinations for locals and tourists. Dusseldorf's Old Town attracts every year visitors and locals to relax and enjoy: cultural attractions, stylish bars and pubs, a wide selection of cozy restaurants, boutiques and stores or a walk on the Rhine promenade. The city of Dusseldorf presents itself at its best. In the late 19th century the construction of the Wuppertal Suspension Railway was decided as a further possibility of transport through the valley of the river Wupper. After only a few months of construction, a first test drive could be already carried out. A very special experience offers a trip with the nostalgic imperial carriage. Visitors expect plenty of variety at the Landscape Park Duisburg Nord: Marvel the fascinating nature, experience sporty highlights or enjoy diverse cultural offer. The Landscape Park Duisburg Nord has the perfect leisure activity for everyone. Baroque town houses, museums and cultural institutions, Neustädter Markt with the world-famous Golden Rider statue – there are many important buildings and cosy cafés at the heart of the new city. Apart from that, the new city is one of the most lively districts of Dresden: Colourful façades, the Kunsthofpassagen and unusual shops.